The more creative chefs are often credited with serving up ‘pictures on plates’ but Nik Chappell, Head Chef at Lower Slaughter Manor is better placed than many of his contemporaries as he actually started out as an artist. Born and bred in Doncaster, South Yorkshire, he studied fine art at the university of Derby and a career in art was the original plan – until his passion for cooking got the better of him. Whilst working at local pubs, Nik began to fall in love with food and so a career in the kitchen beckoned. 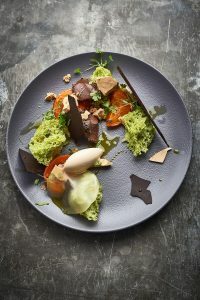 Having previously held Head Chef positions at restaurants including L’Ortolan, Mallory Court and The Tudor Room, Nik has won accolades including four AA rosettes during his time at L’Ortolan and enjoys a reputation for creating exciting and expertly executed fine dining menus.